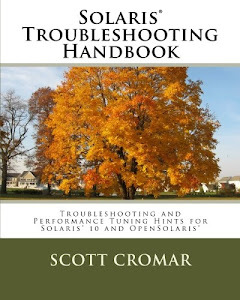 Companion blog for Scott Cromar's Solaris Troubleshooting Handbook and Solaris Troubleshooting web site. The Solaris virtual memory system combines physical memory with available swap space via swapfs. If insufficient total virtual memory space is provided, new processes will be unable to open. Swap space can be added, deleted or examined with the swap command. swap -l reports total and free space for each of the swap partitions or files that are available to the system. Note that this number does not reflect total available virtual memory space, since physical memory is not reflected in the output. swap -s reports the total available amount of virtual memory, as does sar -r.
If swap is mounted on /tmp via tmpfs, df -k /tmp will report on total available virtual memory space, both swap and physical. As large memory allocations are made, the amount of space available to tmpfs will decrease, meaning that the utilization percentages reported by df will be of limited use. If the system is consistently below desfree of free memory (over a 30 second average), the memory scheduler will start to swap out processes. (ie, if both avefree and avefree30 are less than desfree, the swapper begins to look at processes.) Initially, the scheduler will look for processes that have been idle for maxslp seconds. (maxslp defaults to 20 seconds and can be tuned in /etc/system.) This swapping mode is known as soft swapping. where swapin_time is the time since the thread was last swapped, rss is the amount of memory used by the LWPs process, and pri is the thread's priority. If, in addition to being below desfree of free memory, there are two processes in the run queue and paging activity exceeds maxpgio, the system will commence hard swapping. In this state, the kernel unloads all modules and cache memory that is not currently active and starts swapping out processes sequentially until desfree of free memory is available. In the SYS or RT scheduling class. Being executed or stopped by a signal. Blocking a higher priority thread. We may also find ourselves swapping if we are running tmpfs and someone places a large file in /tmp. It takes some effort, but we have to educate our user community that /tmp is not scratch space. It is literally part of the virtual memory space. It may help matters to set up a directory called /scratch to allow people to unpack files or manipulate data. 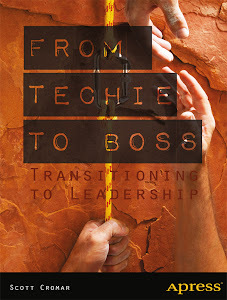 "Survival Guide for the New Manager" at LISA 2015 - I look forward to seeing folks at my tutorial "Survival Guide for the New Manager" at the LISA 2015 conference! Experienced Information Technology leader, author, system administrator, and systems architect. Help fund a church youth group trip to the UN.